Starting with possibly the most commonly used onion of all in the UK, the white onion is layered with a papery white skin and has a mild, sweet flavor. These characteristics make them the ideal companion to a fresh salsa or homemade guacamole. Like the white onion, red onions are sweet and mild in flavor, so much so that they can even be eaten raw. Both the outer skin and inner layers are a deep magenta colour which makes them particularly useful additions to salads and any other dish that is need of a splash of colour to enhance its appearance. Spring onions differ from most other types of onion in that their bulbs are only partially formed. Usually, the entire plant will be used, including its tall green shoots. These onions make for a wonderful garnish on omelettes, soups and tacos, as well as adding colour and crunch to a dish. Spring onions are used all over the world and go by many different names including green onions, salad onions, cebollitas, scallions. As their name suggests, these onions are much sweeter in flavor than their counterparts. With this, they are the ideal choice when making onions rings. Much larger in size and slightly flatter than white onions, the sweet onion also contains extra sugar thus they are particularly useful for caramelising. 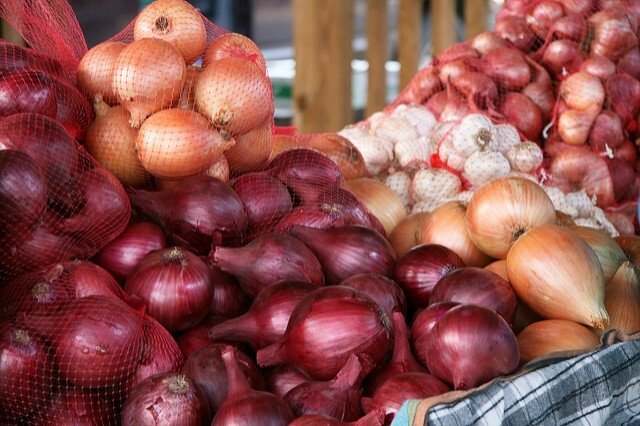 Varieties of sweet onion include Maui, Vidalia and Walla Walla. M&P Engineering is a leading specialist in the design and manufacturing of food processing equipment including their world-famous onion peeling machine. The onion processing equipment uses a self-adjusting assembly of floating knives to top, tail and peel onions from 45mm to 115mm diameter. The onion peeler also uses air compressors to remove the outer layers of onion peel, helping to keep optimum appearance of the final product. M&P Engineering also stocks a range of used food processing equipment to suit your budget. Speak to a member of the M&P Engineering team today by calling 0161 872 8378 to discuss your food processing equipment needs and to find out more about their onion peeler range. Alternatively, contact a member of the team here.